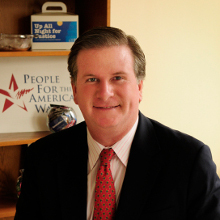 Michael Keegan has extensive experience as a business executive, philanthropist and longtime board member of both People For the American Way and People For the American Way Foundation, beginning his tenure with the organizations in 1994. In that time, Michael has been an active participant on all of the key board committees overseeing the program activities of the organizations. He has shown a deep commitment not only to the institutions themselves, but to the values and guiding principles on which People For the American Way and People For Foundation base their missions. As president, he brings with him a unique wealth of knowledge about People For from his 20 years of involvement with the organization. He is based in Washington, DC after spending 25 years in Southern California. As president, Michael has helped significantly enlarge PFAW’s membership base and expand its work to address the challenges unleashed by recent Supreme Court rulings vastly expanding the power of big money in our democracy. He’s also led the creation of People For the American Way’s Latino voter campaign, which ensures that right-wing candidates are held accountable for their anti-Latino and anti-immigrant rhetoric on Election Day. Under his leadership, PFAW led an unprecedented six-state campaign in 2012 that helped President Obama win a decisive portion of America’s growing Latino vote and thus a second term as president. In 2013, PFAW launched an aggressive media and field organizing campaign in Virginia that led to the defeat of far-right poster boy Ken Cuccinelli. Michael has a rich background in progressive activism, particularly in the area of LGBT equality. He is a founding national board member of The Gay and Lesbian Alliance Against Defamation (GLAAD). Michael also serves as a trustee of the Muriel Pollia Foundation and served on the board of the Los Angeles Library Foundation. Prior to heading People For the American Way, Michael worked in various capacities in real estate and the media and entertainment industries, at companies such as Columbia Pictures and at Act III Communications where he served as president of the 500-screen Act III Theatres Circuit. He received his MBA in International Business and Entertainment Management from Columbia University. He received his BA in American Studies from Vanderbilt University where he was president of the student body. He was awarded a post graduate traveling fellowship to travel and study in 24 countries in the developing countries on four continents. The fellowship is currently given annually in his name.